Year 2 pupils had a very interesting morning at the Canolfan Barcud Centre in Tregaron. The girls put on white pinafores and everyone sat on long benches behind wooden desks. They had to speak English in the classroom. If they spoke Welsh, they had to wear the ‘Welsh Not’ around their necks. The children did some sums and recited the 2 times table using an abacus. The children wrote English words on the blackboard with chalk. Before they answered a question, they had to say ‘Please Sir..’It was all quite an experience. A very different experience to our school, luckily! Thank you to Trystan ab Owen (ex pupil) for being a very strict Sir! We had a lot of fun in Year 1 today as everyone brought in a bike or a scooter to school. We had to cycle very carefully around the school playground and concentrate hard as we controlled our bikes and scooters and navigated around and through cones. Well done everyone on remembering to bring and wear your safety helmet. LAUNCHING A ROCKET INTO SPACE! Pupils at Ysgol Gymraeg Aberystwyth are preparing to launch their very own space mission with the help of a robotics expert at Aberystwyth University. Weather permitting, the mission will lift off from the School’s play ground between 9 and 10 in the morning on Thursday 12 June. In preparation for the mission, the pupils have built a rocket to house the space capsule, and made little plasticine figures who will brave the arduous journey into space. They have also been studying about space, the weather and about other similar launches, and have been working with animator Tim Allen to make animated short films of the intrepid space travellers climbing into the capsule and taking with them messages for Planet Earth. Joining them on board will be an Eco-Schools representative carrying an Eco Schools Flag. Ysgol Gymraeg Aberystwyth is a Platinum Eco-School and the project is being filmed by EcoSchools Wales for a video which will be shown at the International Eco-Schools Operators Conference in Cardiff in December 2014, to mark 20 years of Eco-Schools internationally and in Wales. Speaking ahead of the launch, Mr Clive Williams, Headmaster of Ysgol Gymraeg Aberystwyth said; “Ysgol Gymraeg Aberystwyth is proud to be the venue for this exciting event. The pupils had been studying work about space as part of the science curriculum and have had many and varied experiences whilst building the rocket as part of their craft work. They’ve created a logo in design and technology, studied the direction of the wind in geography and studied similar events through the medium of the internet. “One of the pupils’ favourite stories is the story ‘Y Bobl Fach Wyrdd’ (Little Green People) and they look forward to seeing them leave the school in the direction of space. We hope they return safely! “The School is grateful to the parents for their enthusiasm and to the University for all its support with this every special event”, he added. Using a helium-filled weather balloon, the mission is expected to reach an altitude of around 30,000 metres before falling back to earth. Hanging from the balloon will be a polystyrene capsule fitted with two cameras, two GPS trackers and a small homemade computer that measures altitude, temperature and the motion of the balloon and transmits the information back to earth via a wireless link. Using time lapse technology, the cameras are expected to provide several thousand images of the earth, as the balloon climbs to the very edge of the earth’s atmosphere. Reminiscent of those stunning images taken during some of the early Apollo missions, the images are also expected to show how thin the earth’s atmosphere is in reality. Technology for the mission has been developed by Dr Mark Neal, co-ordinator of the Intelligent Robotics Research Group at Aberystwyth University’s Institute of Mathematics, Physics and Computer Science, and a parent at the school. Mark will be relaying live telemetry as the balloon climbs to around 10,000 metres. Once beyond the reach of satellites, he expects to lose touch with the balloon as it climbs to around 30,000 metres where it will burst before falling back to earth. He expects the whole mission to last between 3 and 5 hours. Once back on the ground, a team will be on hand to find the capsule and return it to Mark who will be able to download the images and all the mission’s data. All being well, the team should be able to track its location to within 30 metres using GPS, once it has landed. Based on current weather forecasts, Mark believes that will be somewhere in Mid Wales! 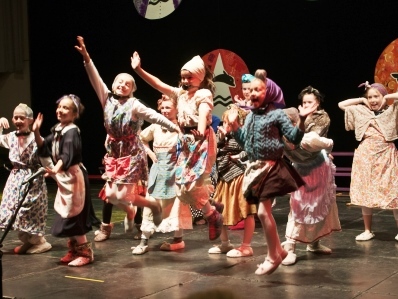 The mission has been developed by pupils, staff and parents at Ysgol Gymraeg Aberystwyth, with the support of Eco-Schools Wales, animator Tim Allen, Keith Morris Photography and Ultracomida. YOUNG AMBASSADORS OFFICIATE AT WORLD CUP! Here are two very brave individuals! 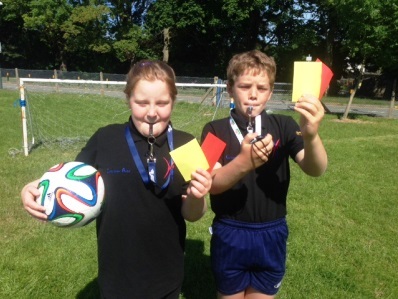 Lisa and Ioan, our Young Ambassadors have taken charge of refereeing our World Cup matches. Both have received training, with a member of staff officiating from the touchlines. They will be responsible for making crucial desicions and to keep time during the tournament. We hope there'll be no need for them to get their yellow or red cards out! 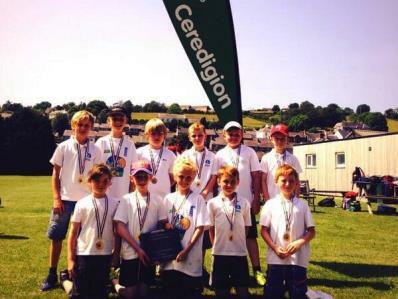 Well done to the year 5 and 6 Cricket team for playing so well in the Aberystwyth Area cricket tournament this year. The team managed to win the first round before continuing and winning two games, but unfortunately lost in the semi-final. Another successful Summer Concert was held at the Great Hall this year, with every pupil taking part in various items to parents, families and friends of the school. Many thanks to the PTA for their support in organising the evening, and to all the parents and families for supporting yet another concert. Thank you also to the evening's sponsors for their generosity. A video of the production will also be available to purchase. More details to follow. As part of our project alongside Eco Schools and Aberystwyth University the animator Tim Allen visited for a day in order to create short stop-motion animations as part of our Rocket Launch which will happen next week. Tim has worked on several well-known animations including Shaun the Sheep, and the children very much enjoyed his workshop, learning about his work and how to develop their own characters and animations. We look forward to seeing the final product! Year 3 enjoyed a lovely morning on Wednesday the 4th, on Peithyll Farm in Capel Dewi. We were given a very warm welcome by Dewi (Maria’s father) from Innovis, who taught us about many aspects of life on a farm. We spent some time and learned about the lambs, saw Joc and Tango the sheepdogs rounding up the sheep, and we even had time to sit in the seat of the John Deere! Thank you to Dewi and everybody at the farm. Congratulations to Steffan, from Year 3, on winning a book review writing competition organised by Oxford Press. Steffan wrote a review of Lewis Carroll’s classic novel ‘Alice in Wonderland’. Well done Steffan, do carry on competing in literary competitions. Following a successful grant application by the Health and Fitness Committee, a larger bike shelter has been built over the Whitsun half term. The new shelter is twice the size of the old one, which means there’s much more space for bikes and scooters, which will be very welcome as more and more children make the effort to travel to school without depending on a car. We look forward to next week, National Cycling to School Week – when the shelter is sure to be full to the rafters! During the Urdd National Eisteddfod at Meirionnydd, Bethan Gwanas’ new novel ‘Gwylliaid’ was launched. Pupils from the school took part in adjudicating the opening chapters of a novel for the T.Llew Jones Memorial Prize last year, and now the winning novel has been completed and published. Ioan represented the school at the launch, and we are all grateful to Bethan Gwanas for giving us the first signed copies of the novel. We look forward to reading ‘Gwylliaid’. Congratulations to Lisa of Year 6 on being chosen to represent Aberystwyth area in the Queen's Baton Relay for the Commonwelath Games. Amongst other pupils from the area, Lisa carried the baton along the promenade in Aberystwyth. Lisa managed to keep her excitement under control, and carrried the baton very elegantly! "I was SO SO EXCITED about carrying the baton. I've been looking forward to it for weeks!" said Lisa.